For successful companies, the primary differentiator from competitors may be the efficiency of their supply chain. An uninterrupted supply chain adds value to the company because it determines the pace at which other operations can press ahead. A bottleneck in the supply chain can have an adverse impact on the company’s brand, revenues, customer satisfaction, and profitability. 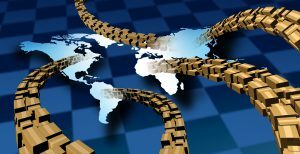 More small, mid-size and enterprise level companies are realizing the numerous benefits by outsourcing supply chain management and logistics to a 3PL provider. A 3PL partner has the logistics advantages, including expertise, technology and network connections, to ensure that the warehousing and transportation component of the operations moves in the right direction. By working with a 3PL provider, a business can take advantage of a vast network of resources and carriers. This enables providers to execute each step along the supply chain efficiently and cost-effectively through leveraging assets, relationships and industry knowledge and experience. It results in lower overhead and quick service delivery because of the international 3PL provider availability of resources that in-house operations cannot match. More businesses find that they can save both time and money by outsourcing their logistics to third-party logistics providers. Generally, these companies provide warehousing, transportation (ground, air, rail and sea), proprietary technology and integrated operation services. Business owners and executives can tailor the 3PL provider services to meet market demands and customer needs. The right logistics service provider has a global network in place to handle paperwork, customs documentation, billing, audits and staffing necessary to efficiently move goods where they need to go for the lowest cost. 3PLs should have knowledge of industry best practices when it comes to packaging, transporting and storing goods in an organized and cost-effective manner. Service providers stay up-to-date with the latest advances in technology, manufacturing and logistics. They have state-of-the-art applications, supply chain transparency, transportation management and inventory control. Three key benefits to outsourcing logistics has to do with the flexibility to scale space, transportation and labor, especially if you experience a sudden spike in demand. Firms that have seasonal variations in their business can plan their budgets accordingly and adjust inventory, space and other resources up or down when needed. Businesses looking to grow and expand into other markets have in place the logistic infrastructure to support their strategic initiatives with incurring increase in costs. Cloud computing, proprietary systems and other technology platforms make it easier to outsource logistics. Smart, transformed companies understand the value that a reliable, accurate and timely supply chain has on the business. Reliable third-party logistics companies have proven cost-effective systems geared to move a large volume of goods and ensure that they get to the location on time. Economy of scale allows 3PLs to build a network and provide the resources businesses need to be flexible and scalable and ensure important needs are met. Third-party logistics providers have the latest technology, industry knowledge and systems to make sure that customer shipments arrive in top condition, at the right place, at the right quantity, and in the right time frame. The third-party logistics firm should provide the customer with transparency, access and the ability to track everything the client needs to know through an interface, data warehousing, advanced reporting and customer-facing web portals. Companies of all sizes can benefit from working with a 3PL provider. Choose a 3PL provider that has the system, financial capabilities and expertise to deliver the requisite services to make operations more effective and efficient. STC Logistics offers international and domestic freight services. To learn more about our shipping options, click below!